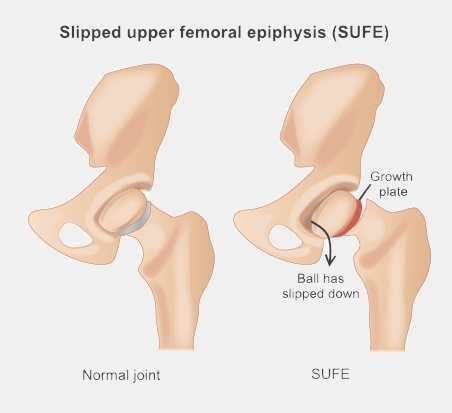 A slipped upper femoral epiphysis (i-piff-i-sis) is a condition involving a child's hip joint that is most common just before or during adolescence. It is also called a SUFE. The hip joint works as a ball and socket, with the top of the thigh bone (femur) shaped like a ball that fits into a socket in the pelvis. A SUFE happens when the growth plate (called the epiphyseal plate) in the ball at the top of a child's thigh bone is weak. As a result, the ball of the thigh bone slips downward and backward. The illustration shows what this looks like. We don't know exactly what causes this, but it may be linked to increased weight and puberty hormones during a rapid period of growth. It usually doesn't happen because of an injury. Although it normally happens in just one hip, occasionally it can happen in both. How do I know if my child has a SUFE? Often the symptoms of a SUFE develop slowly, over several months. At first they may seen like a pulled muscle in your child's hip, thigh, or knee. Or they can happen suddenly, and may be the result of an accident. In these cases your child might have pain in their knee or thigh and may not be able to walk. Some children have only knee pain even though the condition affects their hip. one leg slightly shorter than the other. If you think your child has a SUFE, it's important to get it treated before it gets any worse. The doctor or nurse practitioner your child sees will ask questions about their symptoms, examine their hip and leg, and arrange an X-ray. Your child may also need a CT scan or bone scan. How is a SUFE treated? Your child's treatment will depend on how bad the slip is. Most children need an operation to put screws into the ball of their thigh bone, to keep their hip stable. After the operation, they will have an X-ray to make sure the screws are in the right place. Occasionally a child needs the other hip treated to stop it from happening on the other side as well. Your child will need to stay at least one to two nights in hospital. 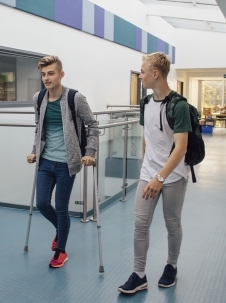 They will be able to go home once they feel comfortable and are safe using crutches or a wheelchair, as they won't be able to stand with all their weight on the affected side for about six weeks. Once the growth plate closes (after they have stopped growing) they may need another operation to take the screws out. There are several things you and your child can do to make sure their bone heals as well as possible. For the first 24 to 48 hours after they come home apply ice to the area for 20 minutes at a time. This helps to ease the pain and reduce swelling. Make sure you wrap the ice in a damp towel or cloth, and don't apply it directly to their skin, or you could cause an ice burn. Your child will need simple pain relief, which the hospital will supply. Make sure they take it regularly, but never give them more than the recommended dose for their weight, which will be printed on the medication packet. Don't give them anti-inflammatory pain relievers such as ibuprofen (Nurofen), as this may slow down their bone healing. Encourage your child to gently move their leg and hip in a way that is comfortable for them. After six weeks of not putting any weight on the affected leg, your child can put some weight on it, with support, for another six weeks. Then they can put full weight on it as long as it doesn't hurt. At this stage they can return to low-impact, non-contact activity such as walking, swimming, and cycling. However they should avoid contact or high-impact sports until they have stopped growing, as until then there is a risk of the SUFE happening again. After their operation, your child will have regular X-rays to make sure their bone is healing well. While most children don't have any long-term complications from a SUFE, in a few children the slip can be severe. This can cause significant changes to their hip joint and lead to a deformed leg, continuing pain, or early-onset arthritis. Therefore, it's important to get treatment early and keep all follow-up appointments, so any issues can be caught and treated early. SUFE can cause a variety of issues for your child, and sometimes further surgery will help. Your child's surgeon will discuss these with you.